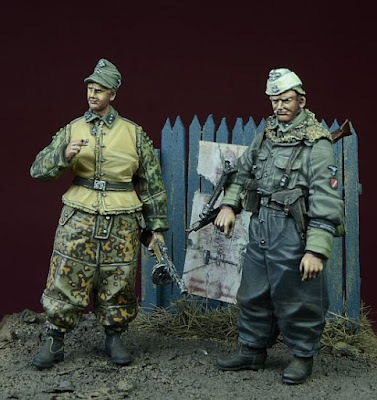 This new figure set from D-Day Miniatures feature these two single men in some down time from their struggle in battle. They are both looking in about generally the same distance from their body language, which is mutual and belies their position in a non-threatening situation. 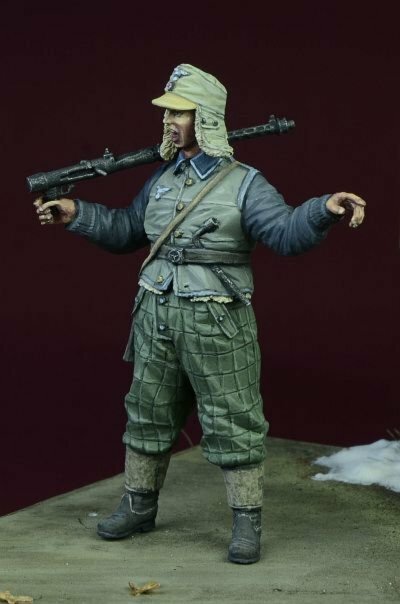 Their thick, winter-weight, late-war camo and uniforms are a good match for each other also. 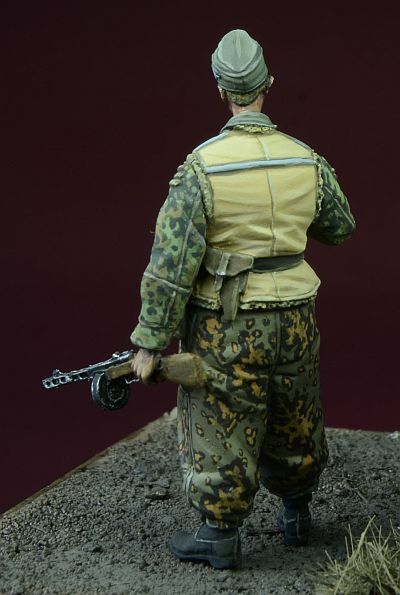 You might notice the red and white painted patch on the left arm of the figure’s overall. 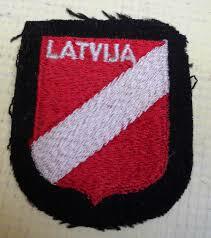 This is a Latvian volunteer’s patch that these soldiers wore to denote Latvia’s assistance fighting for the Germans, and more importantly against the Soviets. 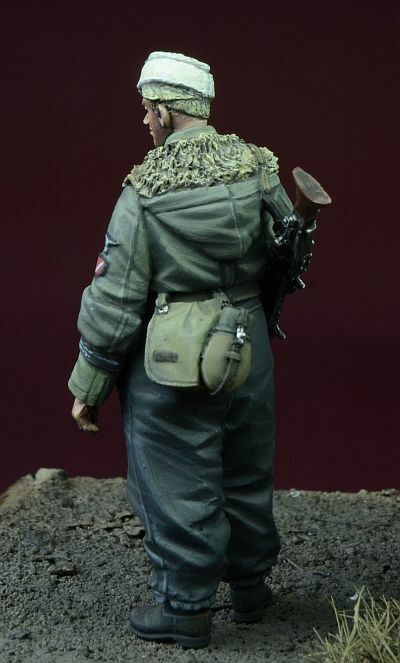 This SS volunteer from the winters of 1943-45 is seen in a passive pose. His all over fur lined overalls dominate the torso of the figure. It covers his uniform and only the collars of the tunic can be picked out. 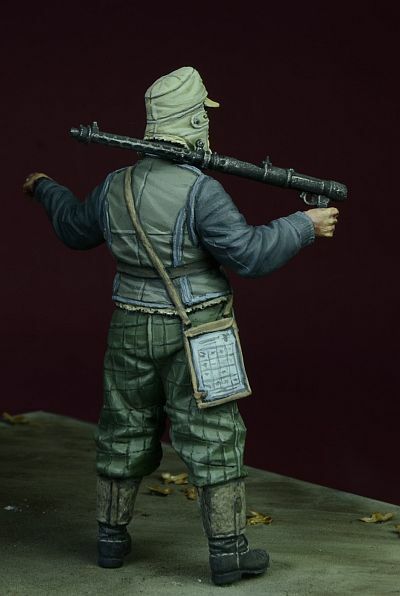 Along with his Mg 42 he is carrying on his shoulder, he also has a bread bag and flask attached to his belt on the rear of the torso. 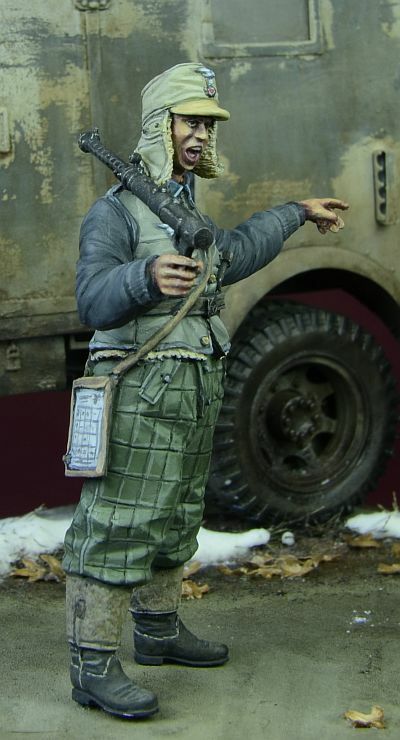 The figure’s woollen side cap and the cigarette in the figure’s mouth are also of interest. 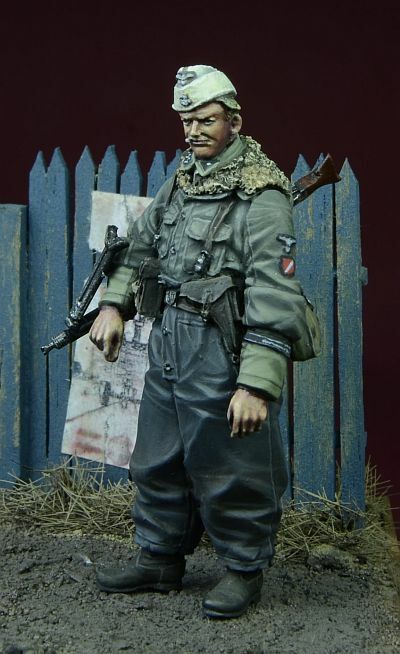 This NCO of the SS is seen in the same one-piece overall that his comrade has on – with this one a fur-lined vest is covering it, and holding it all in. with an NCO’s belt holding it all in there. He has the only one choice of a peaked M43 cap, noted here are the German eagle on the side of the SS man’s cap, with the skull and crossbones on the front along with the round cockade. 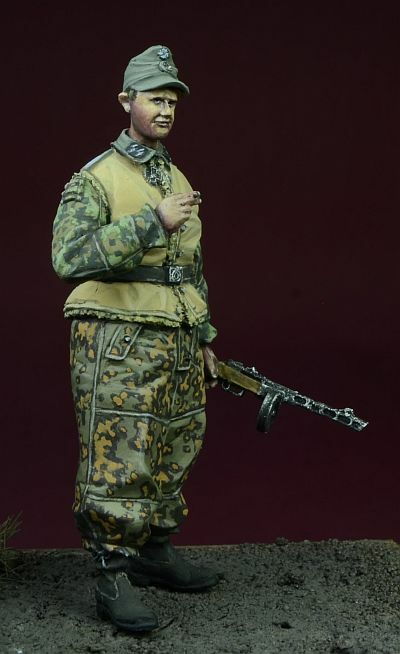 This SS NCO is seen smoking a cigarette (or a cigar) in one hand, whereas the other sees him holding a captured PPSh-41 "pe-pe-sha" from its three-letter prefix and "papasha" (Russian: папаша), meaning "daddy" – this machine pistol had a large magazine, and it could be relied upon due to its rugged nature of construction and larger tolerances than the Mp-40. 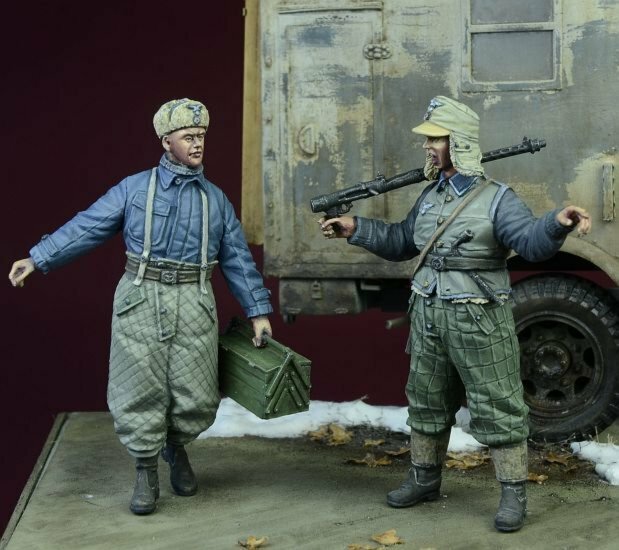 This set (and we don’t know why they weren’t made in 32nd scale so don’t ask) The “foreman” looks like he has a bone to pick with his charge here. A but of workplace bullying is on the menu here – I hope no one gets into trouble…. 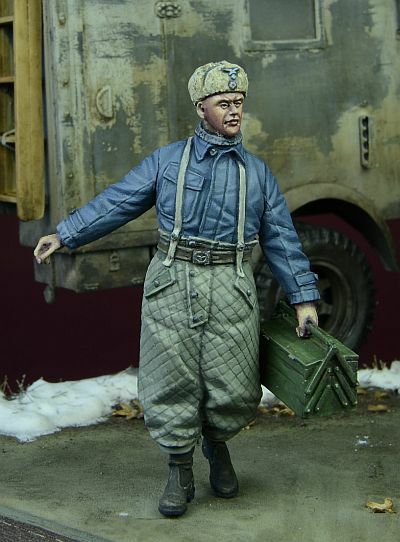 This Luftwaffe mechanic is dressed up for winter in his clothing – with a fur padded Russian style fur hat. 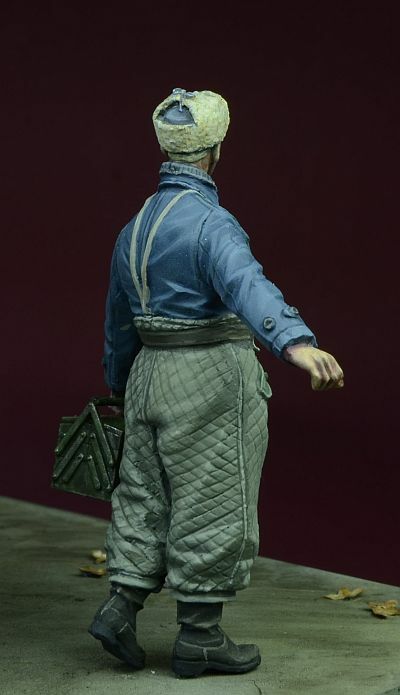 His thick coat is added too with some interesting quilted pants, held up by braces. 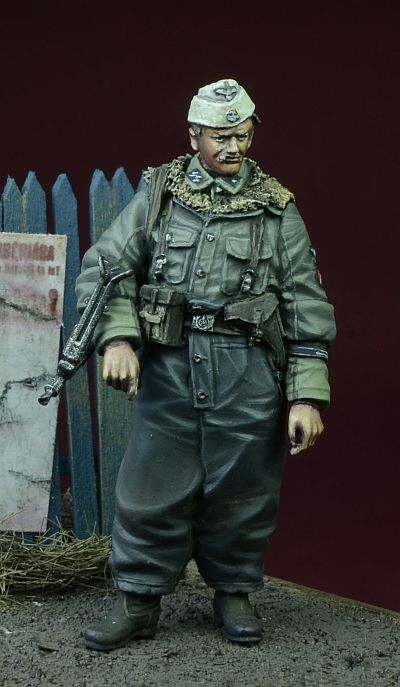 This is an unusual combo, but something due to being a lot of interest to your Luftwaffe ground werk diorama. 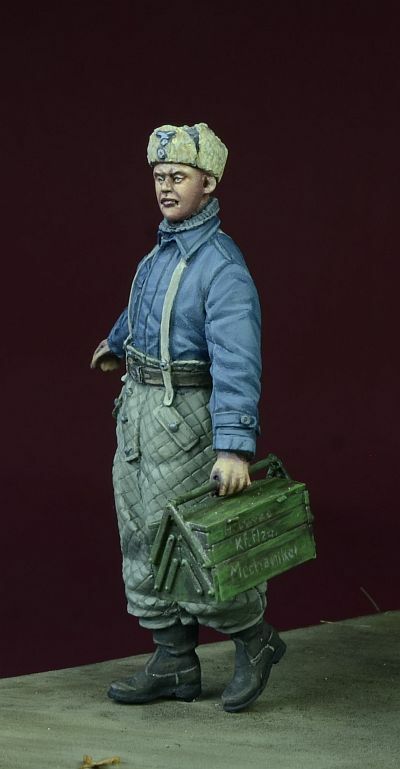 This mechanic is carrying a detailed toolbox in his right hand, it is FULL as you can see the body weight of the mechanic leaning to the side with its weight with his arm up in the air as he hurries forward. 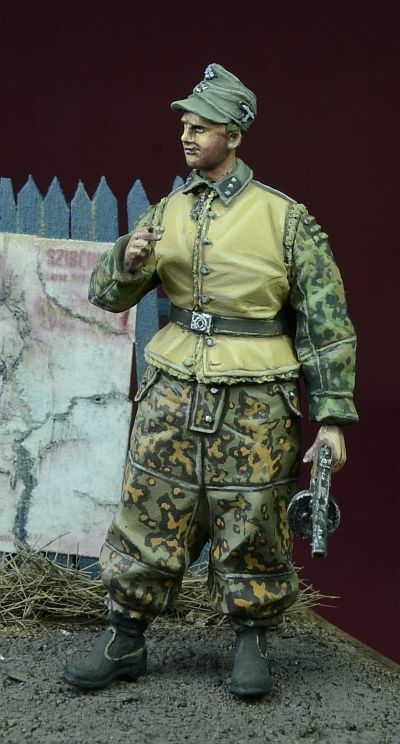 He also wears some unusual checked quilted pants that look very warm with goloshes over his boots. 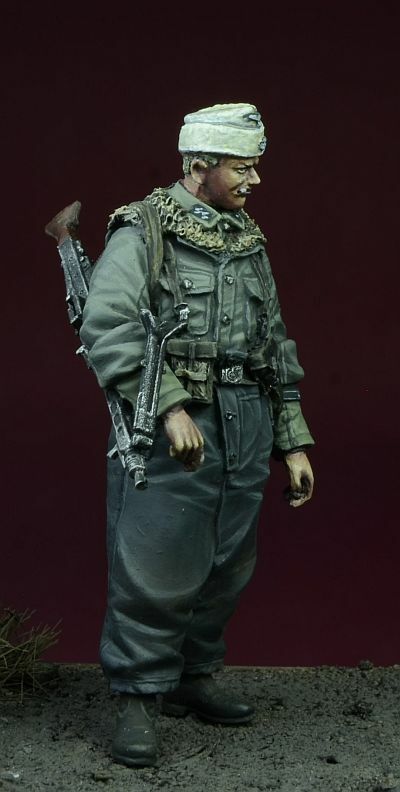 His thick vest is the same type as his comrade’s, these were often made in field, as they were not standard issue, but improvised uniform equipment. Don’t know what his IPad thingy is – I think it’s a work or guide order in a protective case. The hat this soldier is wearing is of the same vein. 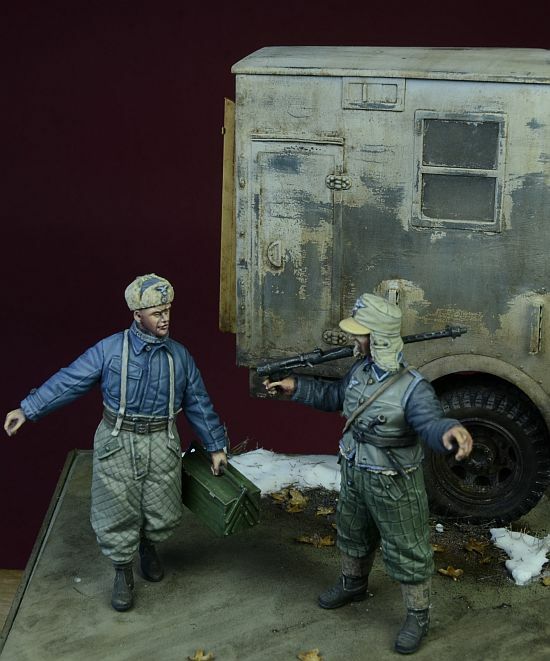 It’s woollen padded insert screams a warm and custom made item that usually NCO’s or higher could get made for them as the demand must have been high in these cold European and eastern front climates in winter. For more details on these figures go on over to the D-Day Miniature Website for distributors Worldwide…They are available now.